Treachery can be beautiful, too. Things have been building up to the events of episode 9 of Hyouge Mono for a while. 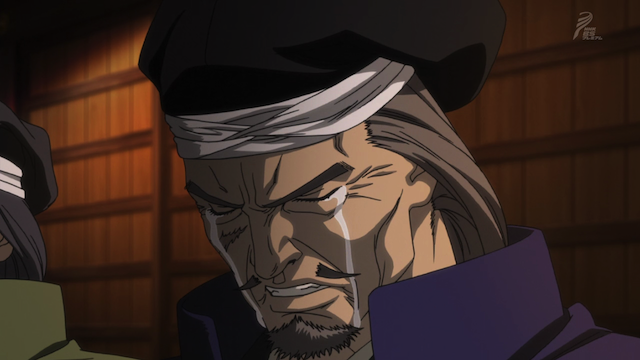 Lord Nobunaga Oda arrives at the Honnou-ji and a tragedy results. 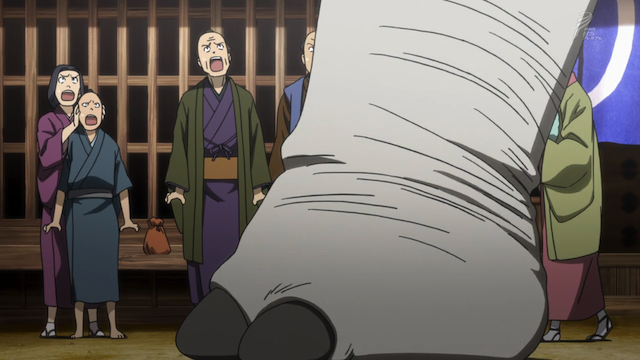 Lord Oda arrives in Kyoto in style -- riding an elephant. 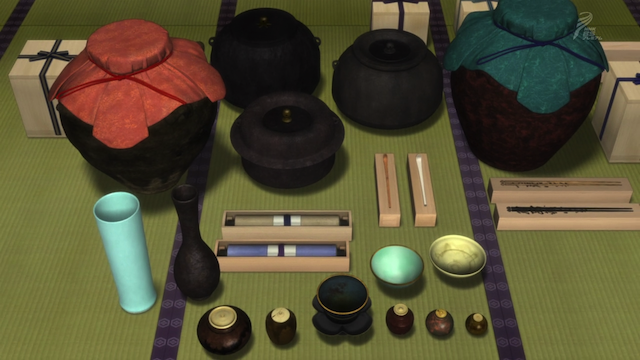 Oda shows off his treasures to the courtiers assembled at the Honnou Temple. 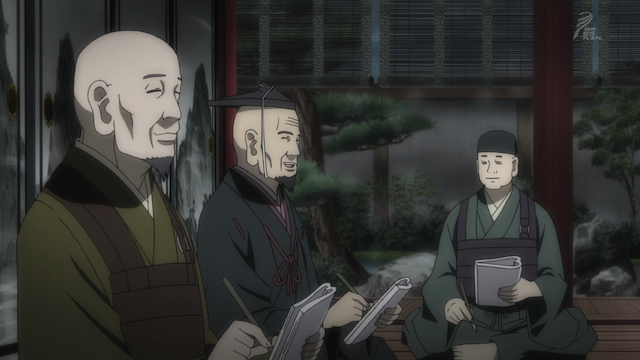 Lord Oda meets with the courtiers to convince them to declare him “God of the Realm”. This is, of course, an insane ambition. After all the court already has a “God” in the person of the Emperor. He manages to impress the courtiers with the incredible treasures he has assembled, however, and he announces his plan to leave Japan shortly, to conquer China. 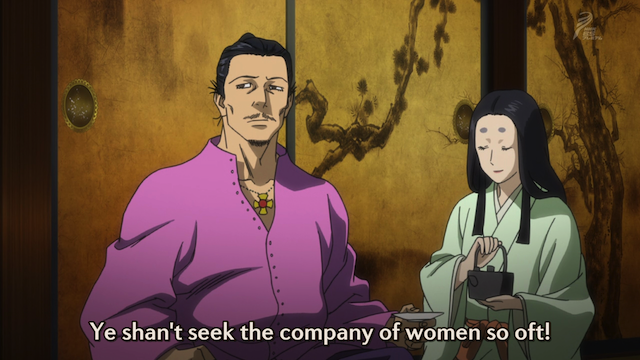 Lord Nobunaga Oda's brother is tasked with assisting in the rule of Japan while Nobunaga conquers China. 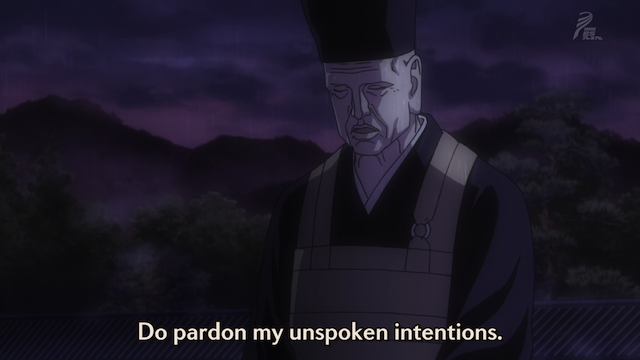 Lord Nobunaga plans for his son to take over the rule of Japan with the assistance of Nobunaga’s brother. Others, however are plotting differently. Lord Akechi's poetry party. This was a famous historical event, and the anime discusses the most significant section of the poem. The guests at Lord Mitsuhide Akechi’s party are playing a poetry game called Renga. Many people gather, drink sake, and collaboratively write poetry. The poems are linked, and use a repeating syllable structure of 5-7-5 followed by 7-7, and so forth, often until 100 poems had been written. Later (about 100 years after the events depicted) the 5-7-5 form was broken off by itself, and became Haiku. 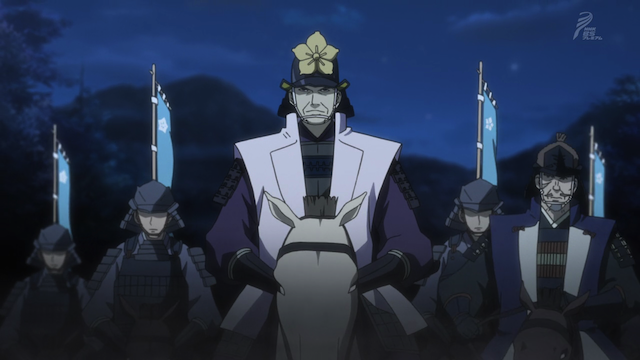 Lord Akechi secretly marches with his army to Kyoto with the intention of slaying Nobunaga Oda. Master Soueki Senno has a special delivery for the Honnou-ji. 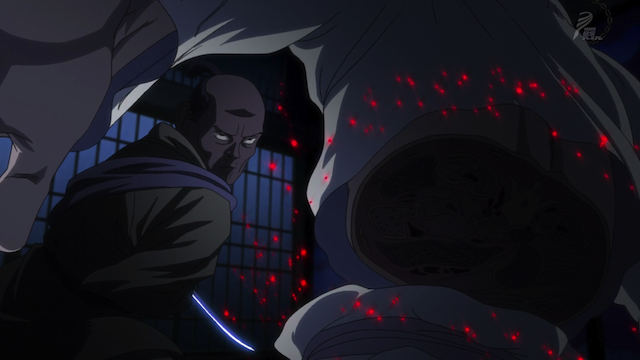 Meanwhile Tea Master Senno shows up unexpectedly to deliver what he claims are jars of gunpowder for Oda’s troops. Later that night, however, Oda wakens to a mysterious sound, and is attacked by somebody who looks a lot like Hashiba Hideyoshi. It's pretty hard to believe Oda can recover from a cut like that. So the big surprise here is that we seem to have deviated from historical fact. The implication is that Hideyoshi, with Senno’s help, assassinated Nobunaga Oda before Akechi was able to attack the Honnou Temple. We’ll have to wait and see what happens next. I’d leave a comment, but instead, I wrote a post.